The Nepal Youth Foundation would like to start several programs, provided we receive enough donations for the full cost of the project. Here are a few items on our „wish list.“ If you’re interested in helping these projects become a reality, please contact us at robin@NepalYouthFoundation.org or 1-415-331-8585 to discuss the possibilities. J and K House, NYF’s excellent homes for children, are currently in rented houses. These are not ideal for many reasons: since we don’t own the land or the houses, we can’t make them ideal for our needs; we want the children to have more space to play outdoors; rent in the Kathmandu area is very high and increases every year; and several times, we have been forced to move to different houses homes because the landlords wanted to use the land for other purposes. We want to buy two acres of land in a cleaner and quieter part of the Kathmandu Valley and build an ideal residence for children, with a playground, a small farm, and a pioneering aquaponics system. An important part of this plan is to form a partnership with a local public school: the children of J and K House will attend the school and NYF will improve the quality of education there. Compared to the private school educations the children receive now, they will be more integrated in the community and will have an easier transition to independence. Furthermore, NYF will save a considerable amount of money on tuition, which we can spend on other programs. We can take this important step forward if we receive all the funding needed. In rural Gorkha district, a very large public school that educates more than 1,000 students is literally falling apart. 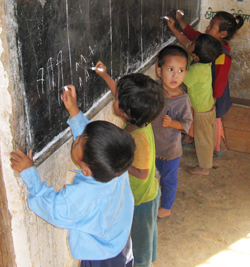 The classrooms are overcrowded, the school lacks water and electricity, and the quality of education is diminishing. However, most students there have no alternative. We are seeking donors who will fund the complete expense of any of these projects. In Nepal, there are several severely disadvantaged ethnic groups. Not only do they suffer from poverty and discrimination, many of the parents are uneducated and do not encourage their children to attend school. They tend to marry and have babies at early ages, further reducing the number of youth in schools. Many schools where these ethnic groups live are in abysmal condition and the teachers are unmotivated. NYF will provide scholarships to members of these groups for 8th through 12th grade, which will enable them to break free from poverty. We will also improve the schools to ensure the students receive adequate educations. We are seeking donors who will fully fund a Community Based Education Project for an ethnic group in one area. In much of rural Nepal, the terrain is very rugged and there are few roads. Many children must walk for hours every day to get to school, which gives them little time to study and leads many to drop out. We want to build dormitories at some of the most remote schools, which we will do if we obtain funding to complete the project. To learn more about how you can support these programs, please contact us at som@NepalYouthFoundation.org or 1-415-331-8585.